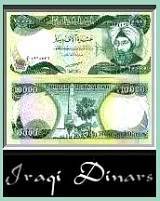 Should you buy some Iraqi Dinars before their currency is re-evaluated? There are many that say no, and others that will tell you to load up now while you can. I would say this, if it won't hurt your pocket book too much, take the risk and buy some. Because there is nothing worse than finding out later that you could have made a lot of money if you did. And if it does not go up, you have some great souvenirs and a very good story to tell. To help you out here is a World Currency Convertor to use so you at least will not pay too much for some. Remember to allow for shipping and such, but not much more than that. Good luck!